Jim Danielski tells horror stories, but not the kind shared with toasted marshmallows around a campfire. Danielski’s horror stories are the kind that should keep Gov. Rick Snyder awake at night. At his career counseling center in Plymouth, Danielski sees a steady stream of people who aren’t ready for Michigan’s new economy. Some have no education. Others have the wrong education. Most have no clue how to find work in world shifting beneath their feet. Harnessing that transition is the challenge facing Gov. Snyder as he prepares a November special address on jobs and talent development. It won’t be easy. Job growth will be slow and uneven through 2018, with new positions paying no more than the jobs they are replacing, according to a Bridge Magazine analysis of federal data. That analysis projects the state’s bread-and-butter occupations in factories will stagnate, while two-thirds of new jobs will require post-high school training. And among college graduates, there are troubling signs that far too many will have diplomas in fields more likely to land them in the unemployment office than the country club. Today and Sept. 15, Bridge will examine the state’s rapidly changing work force, and how Michigan families, colleges and government leaders will need to scramble to keep pace. For families, clinging to the middle-class lifestyle Michigan residents took for granted during the auto industry's heyday, the new economy will require workers to not only work smart, but train smart – carefully selecting fields that improve their odds of earning a good paycheck. For colleges, the new economy likely will mean more partnerships with industries looking for specific skills and increased pressure to steer students to growing fields. And for Snyder and other state leaders, it means facing some uncomfortable truths about Michigan’s future, and taking steps to address the mismatch between jobs and education. To conduct the analysis, Bridge combined long-range occupational projections from the U.S. Bureau of Labor Statistics, 2011 wage data from the BLS and educational attainment data by occupation from the American Community Survey. The data was adjusted using economic data and projections from Economic Modeling Specialists Inc., in Idaho., and the Center on Education and the Workforce at Georgetown University. The projections paint a troubling portrait of a state in the throes of transformation. An estimated 378,500 jobs will be added to the Michigan economy between 2010 and 2018, for a total of 5.382 million (a figure that includes self-employed, farm workers and those working in family businesses, along with traditional payroll jobs). That’s an annualized growth of 1 percent. That level of growth would leave Michigan burdened with high unemployment for most of the decade. Consider this: There are more unemployed Michigan residents (496,000, as of July) than jobs projected to be added to the economy 2010-2018 (378,500). Traditional payroll jobs, the kind that more often include benefits such as health insurance and paid vacation, will grow even more slowly – about 0.7 percent a year. Those new jobs won’t be the only openings – in fact, jobs added to the economy are less than a third of total openings, with the rest being the result of “churn” – existing jobs in which workers retire, die or leave the work force and others are hired to replace them. About 1.4 million total openings are projected through 2018, or about 177,000 per year. Median household income in Michigan dropped from $54,651 in 2000 to $45,254 in 2009 (in 2009 dollars), says the Census Bureau, a decline in spending power equivalent to a year’s tuition at Central Michigan University. In 1990, Michigan ranked 14th in the nation in median household income; by 2009, the state had plummeted to 34th. That precipitous drop not only has implications for the buying power of families, but for businesses where those families are buying less, and for state government, collecting less in income tax. Of the 25 occupations with the most total job openings through 2018, 19 offer current wages below the state average of $19.43 an hour. The top three occupations for openings – retail clerks, cashiers and waiters/waitresses -- earn between $9 an hour and $11.73 an hour. Meanwhile, 38 occupations that earn above-average wages are projected to employ fewer people. Leading the losses are jobs that have traditionally been viewed as safe: postal workers (projected to shrink by 1,314); tool and die makers (minus 833); even the number of mechanical engineers, who earn an average of $40.27 an hour, is projected to drop by 521. So where are the jobs of the future? According to Bridge's projections, the health-care industry holds the promise of the most new jobs, while the fastest-growing field will be oil and gas extraction. Nearly one in five jobs added to the Michigan economy will be in health care, a result of the state’s aging population. The largest chunk of new health-care jobs will be in support positions – health-care aides. That field will add 32,000 jobs by 2018, the equivalent of two busloads of new workers every week. Those jobs pay below average ($22,000 to $26,000 a year), but usually include health-care benefits and are often used as stepping stones to better jobs. There are a projected 3,185 openings per year for registered nurses, who earn an average of $63,000 a year, and 985 openings annually for doctors. Four of the five fastest-growing occupations by percentage growth, and eight of the top 13, are in the petroleum industry. All pay wages far above the state average. More than four out of 10 new jobs created through 2018 are projected to be non-payroll jobs, primarily people who are self-employed and contract workers. Those jobs usually do not include benefits such as health insurance and paid vacation. Glazer does, though, believe one trend will continue: Jobs of the future will require more and more education. Not anymore. Your chances of finding a job rise dramatically with education. If Michigan’s jobless pattern is similar to that of the nation's, almost 20 percent of high school dropouts were unemployed in June, compared to 13.8 percent of high school grads, 9.9 percent of Michiganians with some post-high school education (certifications, associate degrees or some college credits), and 4.6 percent of those with a bachelor’s degree or higher. The jobs being added to the economy accelerate the pattern. Among jobs projected to be added in Michigan by 2018, seven out of 10 will require some post-high school education. More than 37 percent will require a bachelor’s degree or more, compared to 29 percent today. Only one in 20 new jobs will be available for high school dropouts; about one in four will be open to high school graduates. The differences are just as stark in paychecks. Drop out of high school and you doom yourself to a life of small paychecks. The professions which employ the highest percentage of high school dropouts all pay well below the average. Half of the workers in agriculture are high school dropouts – they earn, on average, $10 an hour. A quarter of the workers in ground maintenance are high school dropouts – they earn, on average, $11 an hour. High school grads have more options, but still typically earn 78 percent of the state’s average salary. Two professions that employ among the highest percentages of high school grads – construction trades and motor vehicle operators – pay slightly better than average wages. Both of those occupations are projected to grow by 6 percent by 2018 and have a few thousand annual job openings. Other likely occupations for high school grads, such as funeral service workers and loggers, pay below average wages. An associate's degree, certification or completion of some college classes will become the minimum needed to earn an average paycheck of $19.43 an hour, the data show. Holders of bachelor’s degrees earn 142 percent of the state average (almost double that of high school grads); master’s, 167 percent; and holders of doctorates or professional degrees, such as law and medicine, earn more than double the average (210 percent). But is all education equal? 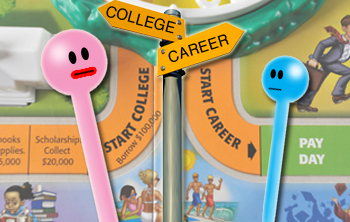 In a tight job market, economic winners and losers may be chosen as much by career path as by the letters on a diploma. About 23 percent of Americans holding a bachelor’s degree earn the same or less than high school graduates, according to The Center on Education and the Workforce, based at Georgetown University. 3,700 people with an associate's degree or higher will work in ground maintenance, where the current average wage is $11.36 per hour. 4,700 with a bachelor’s or higher are projected to work in building cleaning and pest control, taking home an average of $10.93 per hour. 164 people with a master's degree will work in food preparation/service, with an average pay rate of $9.15 per hour. Former Gov. Jennifer Granholm long pushed to increase the percentage of Michigan residents earning college degrees, believing education was the key to reinventing the state economy. But thousands took those sheepskins and left the state for jobs. Meanwhile, some Michigan employers can’t find enough skilled workers. To break that trend Snyder must match education with opportunity, tailoring talent to improve the odds of residents finding work and earning a decent paycheck. “The trend is, the more educated your work force, the more ready you are for changes,” Good said. In a state that thrived for a century by not changing, the decade ahead looks most unsettling. Part of the problem is that parents and educators rejected vocational education in the schools during the 1990s in a blind rush to send everybody to college. There are skilled trades jobs that can't be filled in Michigan. Not everybody should be pushed toward higher education. In the first 2/3 of the article, the author describes a long term and widespread unemployment problem due to a depressed economy. In the last 1/3 he seems to recommend a solution more attenuated to structural unemployment (i.e. insufficiently trained people for the professions that are growing). If we were experiencing structural unemployment, incomes would be surging in some fields while lagging in others. The data on median income would suggest that this is not the case. The only solution to this problem is to increase demand, first through government spending and later through consumer spending. Interestingly the only growth occupation with high hourly wages is teaching - a profession the Republicans in this state have been at war with since the Engler administration and which Snyder continues to cut.